We have covered the Wikipedia Screensaver in the past which displayed and rotated through random Wikipedia pages. Some users did not like the randomness of the screensaver which could bring up inappropriate content on the computer screen. The Wikiquote Screensaver makes use of yet another Wikipedia site but gives the user more control over what is actually displayed when the screensaver activates. 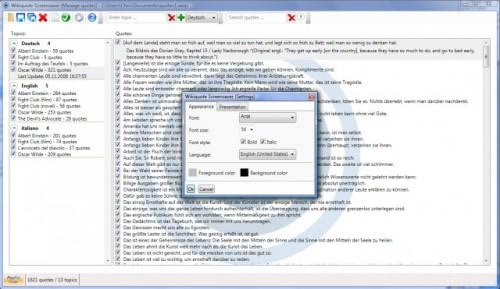 Wikiquotes provides access to a large collection of quotations in several languages. The screensaver makes use of an interface that can be used to add quotes to the screensaver. At least one quote has to be added before the screensaver starts working at all. This is done by searching for a name or term. A list of matches will then be displayed. By default all are selected to be added to the screensaver's rotation. The quotes that have been selected have to be saved in the end. Once that is done they will be displayed when the screensaver becomes active. The screensaver requires the Microsoft .net Framework 3.5 Service Pack 1 to function. The pack can be downloaded from Microsoft. What's your favorite quote? Let me know..